They examine the topological structure of the electron density of the series 1,2-ethanediol 1, 1,3-propanediol 2, and 1,3-butanediol 3. They find a bond critical point (bcp) between the hydrogen of one hydroxyl group and the oxygen of the second hydroxyl group for the two large compounds 2 and 3. This forms a ring, and a ring critical point is located as well. However, for 1 they find no bond critical point associated with what might be the intramolecular hydrogen bond in 1. For all three diols, the OH stretching frequencies are diminished relative to monoalcohols. So geometrically and spectroscopically there appears to be a hydrogen bond, but rigorous application of Bader’s notion of bonding says that there is no “bond” in 1. Lane and coworkers go on to show that the electron density in the three diols is really topologically identical, just differing in a matter of degree. They conclude that the existence of a bond critical point should not be the sole arbiter of bonding, but one of the criteria that can be utilized to assess bonding. While I am not at all in conflict with this conclusion, the paper contains some issues that need be addressed. First off, “bonding” is not a concept of either-or, rather there is a continuum of bonding. Hydrogen bonding should not at all be confused with covalent or ionic bonding – it is dramatically weaker and so one might consider whether the bcp criteria is applicable at all. The authors really fall into this trap stating “… the absence of a BCP should not necessarily be considered evidence as to the absence of a chemical bond (emphasis mine).” Do we want to consider a hydrogen bond as a chemical bond? I think the key element overlooked in this study is the strength of the “hydrogen bond”. While not determined in the study, undoubtedly the hydrogen bond strength increases in the order 1 < 2 < 3. What is really to be gained by arguing there is or is not a “hydrogen bond” in all or some of these three molecules? The ring-like conformation is the lowest energy conformation for all three. This is driven by some electrostatic attraction between the OH dipole of one hydroxyl group for the dipole of the second hydroxyl group. When do we want to call this attraction a hydrogen bond? What do we gain by not doing so for all three? If we understand that there is an energy continuum of hydrogen bonding, from weak to weaker, doesn’t that provide enough of a model to interpret and predict chemical structure and behavior? (1) Lane, J. R.; Contreras-García, J.; Piquemal, J.-P.; Miller, B. J.; Kjaergaard, H. G. J. Chem. Theor. Comput. 2013, 9, 3263-3266, DOI: DOI: 10.1021/ct400420r. The x-ray structure does show a saddle geometry for 2. 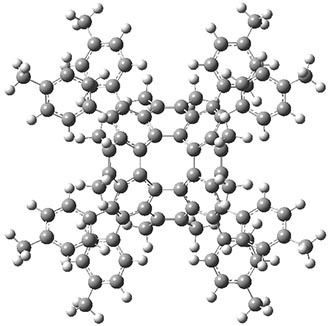 The central 8-member ring is tub-shaped, even more puckered that cyclooctatetraene (COT) itself, though the bonds in 2 are nearly of equal length. 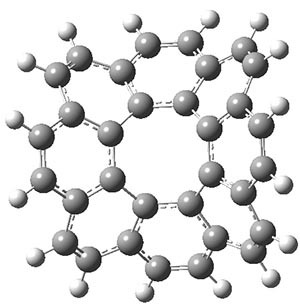 The bond lengths involving the central carbon atoms appear consistent with an radialene-type structure. The ωB97X-D/6-31G** optimized geometries of the parent compound 1 and the synthesized compound 2 are shown in Figure 1. These computed structures are very similar to each other, along with being very similar to the x-ray structure of 2. Figure 1. ωB97X-D/6-31G** optimized geometries of 1 and 2. 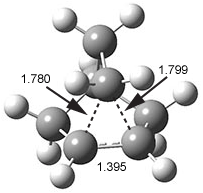 The computed NICS(0) (at HF/6-31+G* – I would really rather have seen these computed with some density functional, preferably at ωB97X-D/6-31G**) values for the six-member rings of both 1 and 2 are negative, ranging from -8.9 ppm to -4.0 ppm, indicating aromatic character. 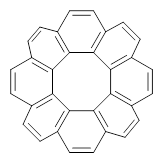 The NICS(0) value at the center of the 8-member ring is +9.8 ppm in 1 and +12.2 ppm in 2. The authors argue that this value cannot discriminate the 8-member ring from that in COT (NICS(0) = 1.98 ppm, the expected value for a non-aromatic ring) and radialene (NICS(0) = -1.2 ppm, also an expected value for a non-aromatic ring). 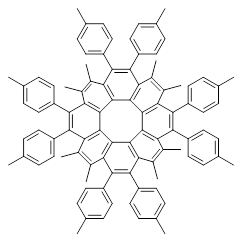 However, they are silent on whether this might actually imply some antiaromatic character to the 8-member ring, which would be consistent with the equivalent bond lengths around the ring. The authors note that there should be a second isomer of 2 resulting from a flip of the tub. Variable temperature NMR does not show any change in the spectrum, though with a different substituted circulene they do see some coalescence, suggesting a large flipping barrier of at least 20 kcal mol-1. A computational search for this flipping/inversion might be interesting as the transition state is likely to not be planar. (1) Feng, C.-N.; Kuo, M.-Y. ; Wu, Y.-T. "Synthesis, Structural Analysis, and Properties of Circulenes," Angew. Chem. Int. Ed. 2013, 52, 7791-7794, DOI: 10.1002/anie.201303875.